EAC Eclipse as seen in Inferno Release 1. 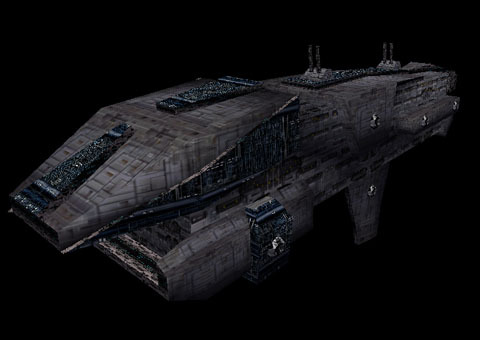 The EAC Eclipse is the Earth Alliance's heavy cruiser. 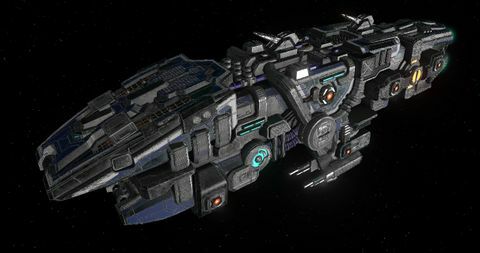 It resembles the GTC Leviathan in being very heavily armed and armored but slow. The initial counterstrike against an Eclipse cruiser division resulted in 100% casualties. Mounting four swarm turrets for the EA's vicious Stinger swarm missiles, the Eclipse is a nightmare to attack in a fighter or bomber at close range. A single round of Stingers is usually enough to shoot down a fighter. Even capital ships must be wary of her multiple light beam turrets - the Eclipse is very well armed for a ship of her size, although she pays for this with a low maximum speed. The Eclipse is a very strong opponent with powerful offensive capabilities. Its three main armament types - swarm missiles, cluster and heavy flak guns, and the notorious 'Gattler', are very lethal against fighters that get too close. The Eclipse's anti-warship armament include two small EA rail-cannons and a single forward-mounted beam cannon. All this firepower in such a small frame does not come without a price, of course, as the Eclipse pays for this with a low engine output.